California-based IHOP, or International House of Pancakes LLC, has introduced a new line of convenience meals to the U.S.market. Called IHOP at Home, these new products are frozen, ready-to-eat meals that just need a few minutes in the microwave oven before it is ready to be served. According to research, 84% of all breakfast meals are made at home. However, more and more of America’s consumers are becoming busier and busier each day, making it difficult to prepare quality breakfast meals in a short time. IHOP has answered this dilemma by introducing its new product to the American market. The company is proud to have been able to come up with this line of quality convenient meals that consumers of all ages can bring to school or work without having to spend too much time in preparing it. This new line of frozen breakfast meals was created with busy consumers in mind. Not only is it a convenient meal, it also is a satisfying one. A few minutes in the microwave are all they need before they are ready to eat. Varieties of these frozen breakfast meals are Omelet Crispers, French Toast-stuffed Pastries and Griddle’n Sausage Wrap. The Omelet Crisper variety is a combination of scrambled eggs with a choice of several cheese varieties. The French Toast-stuffed pastry variety is basically French toast stuffed with apple & cinnamon, strawberry, cream cheese, or both. The sausage wrap variety is breakfast sausage enrobed in pancake batter (buttermilk) and added with a little maple syrup. These new frozen breakfast meals from IHOP are currently only available in Wal-Mart stores. Suggested selling price for the French Toast-stuffed Pastry variety is $2.85, while the other two varieties are both $3.79 each. I bought frozen pancakes with the best syrup to put on them and now can’t find them! Where can I look? I can’t find any I Hop breakfast sandwiches anymore since about early 2015. What Happened? I liked the bacon & egg flat bread especially. Looked at Wal Mart for the pan ales we have a coupon for. No IHOP items in the freezer section. Why did our Walmart in Savannah, and Selmer Tennessee stop selling IHop frozen Breakfast sandwiches? Now we have no way of getting our favorite Bacon, Egg & cheese on Flatbread. Cannot find them anywhere in our area. Can these be purchased direct from a distributing market? I HAVE TRIED THE I HOP AT HOME STUFFED FRENCH TOAST(APPLE). ALTHOUGH IT WAS GOOD, THE BOX WAS VERY MISLEADING…. IT WAS ALL BREAD, WITH A LITTLE FRUIT FILLING… IF IT WAS MADE LIKE ON THE BOX IT WOULD HAVE BEEN BETTER. I'LL PAY FOR MORE FILLING DON'T SKIMP ON MY FIRST MEAL OF THE DAY! Like the French toast sausage sandwiches but cannot find any in this area. 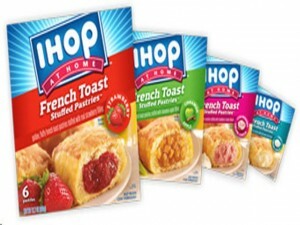 Yes, I really like the I-Hop frozen grocery items, but can’t find them anywhere!